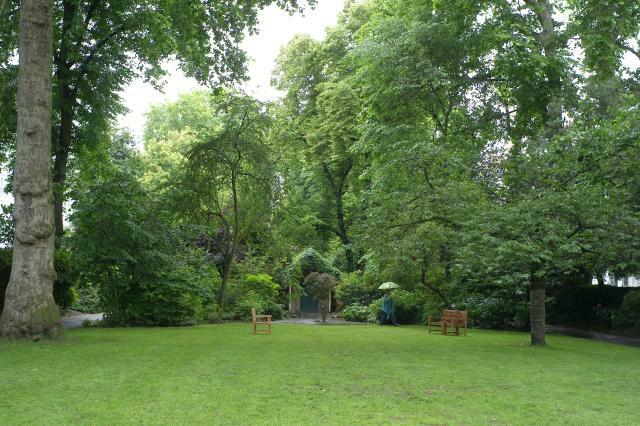 Cornwall Gardens is an elongated garden square with three private communal garden enclosures. It was developed by Thomas and John Broadwood, whose family owned the land, and became famous as piano makers. The gardens have magnificent plane trees dating from the 1870s and are overlooked by Italianate terraces probably designed by the Broadwood estate surveyor Thomas Cundy III. The central garden has the original arched cast-iron entrance gates but the perimeter railings were removed during WWII, and the gardens are bounded by privet hedges. LBII: 6-16 consec., 17-44 consec., 55-82 consec., 83-93 consec. Cornwall Gardens, Cornwall House and Garden House and railings to east. Cornwall Gardens was developed on a thin block of land stretching east and west, which belonged to the Broadwood family from 1803 and was at that time a market garden. Thomas and John Broadwood were probably encouraged in their endeavour by the success of the Vallotton Estate to the north. The original layout and the design of the earlier houses is ascribed to Thomas Cundy III, the estate's surveyor, from whom they commissioned two tall Italianate terraces facing a central communal garden flanked by two access roads with mews at the rear, described by Nikolaus Pevsner as 'the classic Kensington High Victorian formula'. It was named Cornwall Gardens for the Prince of Wales' coming of age. Building on the north side commenced in 1871, with the last group that faced Gloucester Road completed by 1876. Its early residents included lawyers, senior civil servants and Empire administrators, and Thomas Cundy III himself moved into No.82. The west end of Cornwall Gardens was built a little later between 1876-8, probably to the designs of Edward Habershon and Brock, and developed by builder William Willett, Cundy apparently losing interest. Thomas Cundy's original plan had allowed for a church and more housing to complete the western end but this was prevented from taking place due to the cutting of the Metropolitan and District Railway. Constructed between 1864-69, the railway took in this end of the site on a north-west/south-east axis (see Daws' map of 1879). The land was eventually returned to the estate by 1875, and Willett's plans to complete the development were then approved. These included two vast and elaborate buildings, influenced by the French Renaissance style then fashionable, the Garden House and Cornwall House. Designed by James Trant Smith, they were built in 1877-79. The communal gardens remain private today, maintained by a Garden Committee for the use of permitted keyholders, and consist of three enclosures divided by the access roads. Each section is laid out formally with straight paths around the perimeter, although the central section had semi-circular paths at each end, thus giving them more emphasis. The central garden retains the original arched cast-iron entrance gates but the perimeter railings enclosing the gardens were removed during WWII; their reinstatement has been proposed by Cornwall Gardens Residents Association. The eastern and central enclosures are enclosed by privet hedge, while the western enclosure is railed and more visible from the exterior. The gardens are shaded by particularly tall plane trees dating from c.1870, but an irrigation system enables lawns and flowering shrubs to flourish and has made further planting possible.